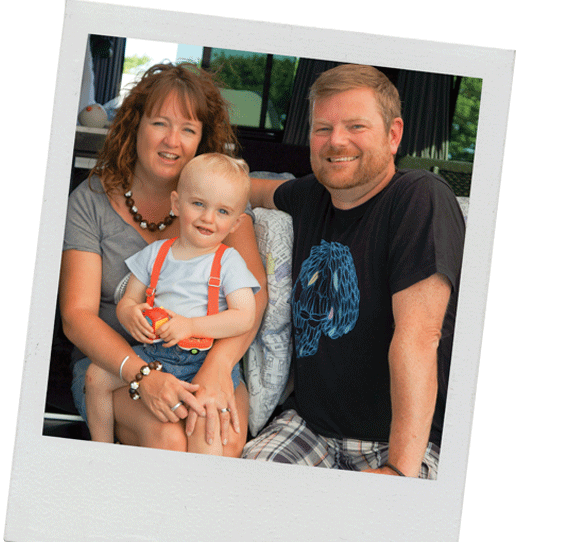 Babean is a family company run by husband and wife, Dan and Claire Spencer and it was born from a desire to give their own baby, Stanley, proper tasting nutritious food from the outset. When they reached the weaning stage and their freezer was filling up with sauces and baked goods because they couldn't find anything like them in the shops, the idea of selling the food, came to them. When it got the firm approval from all the local parents at various local food festivals, the business was truly set and the process of growing, one step at a time, began. Babean is now stocked in a range of local farm shops, listed here and after people all over the country joined our Facebook page wanting to know how they could get it, they set about making this website so you can order online. Please remember to like Babean's Facebook page to get the latest news and even some free recipes! "Babean make my life sooooo much easier. My just 3 year old and 15 month LOVE them, especially the muffins and the Pesto sauce. I know they are healthy, homemade and delicious so I don't feel guilty using them as a snack or main meal. Brilliant for when we are away, picnics, when I'm struggling for ideas or for just giving me the night off cooking!" "Having a 2 and a half year old and a 6 month old I don t have a lot of time to spend hours in the kitchen creating healthy organic meals for my kids Babean is the perfect option home cooked, balanced, healthy food that my kids love! Yum yum yum"
Virtually all the baby food and toddler snacks in the shops at the moment are found on unrefrigerated shelves, even the ready meals! Disappointingly, it's become the norm and for the manufacturers to achieve this they have to heat treat their products or worse still add preservatives which both drastically reduce the flavour and nutritional value of the product. Compare this philosophy to your own ready meals- If you fancy a night off cooking do you reach for the vacuum packed ready meal on the shelf or the frozen one that promises more flavour? Once you're past the weaning stage, real foods with real flavours and textures are going to be a shock to your little one and suddenly you've got a prime candidate for a fussy eater. If you've ever tried the contents of a jar, pouch or sealed ready meal we're sure you'll agree, they aren't a proper introduction to food even if they do provide convenience! It's for this reason we freeze all our food as soon as it's been created. This seals in the flavour and freshness to give you fabulous frozen food for your baby and toddler. We're subjected to enough pollution and toxins in our daily lives so why eat food that's been treated with pesticides and other nasty chemicals? We use natural ingredients, free from pesticides and chemicals in all our recipes, not because it's the in thing to do but because we believe it's the best thing for your little ones and we're sure you want to give them the best start in life. All our vegetables, dried fruits and grains come from a dedicated natural wholesaler - check out the ingredients list on our packaging to see just how much goodness we cram in there. It's way more than the minimum amount required to say "it's natural" and that's because we do it for genuine reasons, not just to make the packaging look good!